Our 3rd to 5 Grade students explore a new story or theme every 4-6 weeks approaching the story from a new vantage point each week. WE explore the Rotation theme with games, movies, art, cooking and of course in the computer lab. It is designed to help this age group see their place in God’s diverse and challenging world. Knowing that kids learn in very many different ways, and that feeling welcome and comfortable is a key component to learning, we have designed our classrooms with kids in mind. Children of this age are encouraged to become Acolytes and Junior Choir members so as to participate fully in the worship experience on a regular basis. 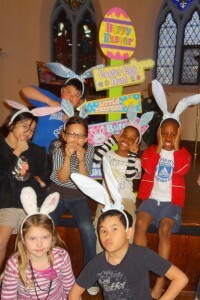 Special Events such as Breakfast with Santa and Easter Bunny Egg Hunt and Barbeque continue to build community amongst families with children in this age group. During coffee hour the balcony comes alive with intergenerational air hockey and foos ball games.